THIS LISTING HAS A GORGEOUS KREISS NAPKIN LADY! 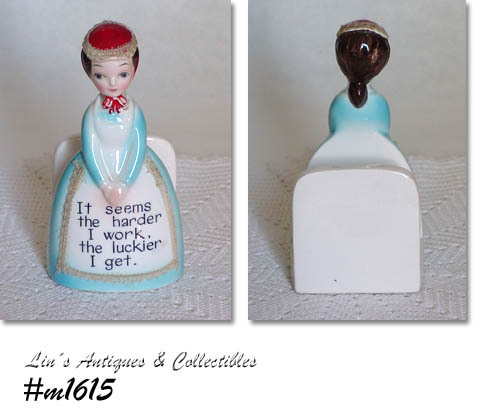 SHE’S THE TALLER SIZE (10 ¼”), BOTTOM IS STAMPED KREISS & COMPANY, MADE IN JAPAN. SHE’S IN SUPER CONDITION – NO CHIPS OR CRACKS. ONE EYEBROW NEEDS TO BE COLOR TOUCHED-UP – THAT’S IT! 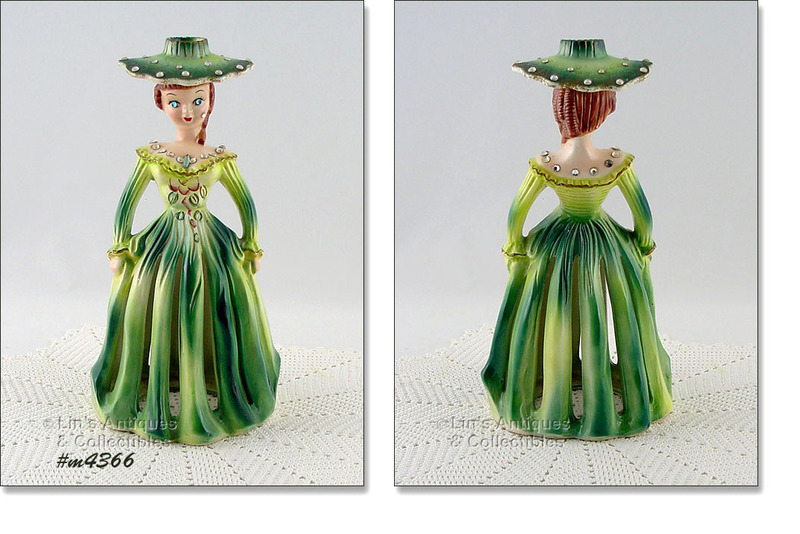 THIS IS AN EXCELLENT CONDITION KREISS NAPKIN LADY AND HER HAT IS A CANDLEHOLDER! SHE’S THE TALLER SIZE AT 10 ¼” AND BOTTOM IS STAMPED KREISS & CO., MADE IN JAPAN. SHE HAS RHINESTONES AND “BIRTHMARK” ON HER CHEEK. SUPER COLLECTIBLE! ISN’T THIS A CUTE NAPKIN HOLDER? 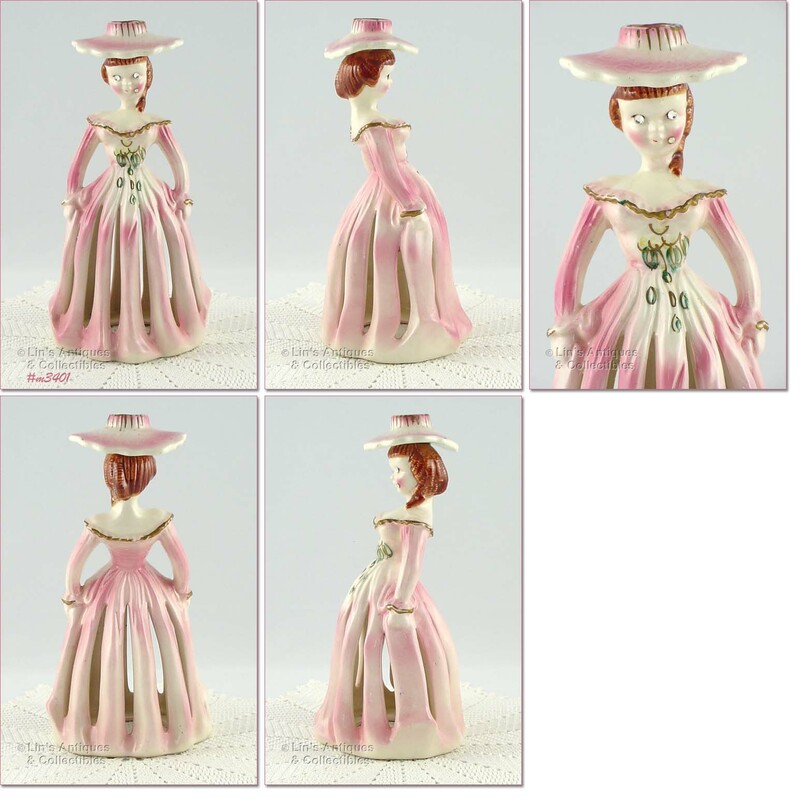 SHE’S A DUTCH GIRL – DIFFERENT THAN ONES USUALLY FOUND – AND SHE’S IN EXCELLENT CONDITION! 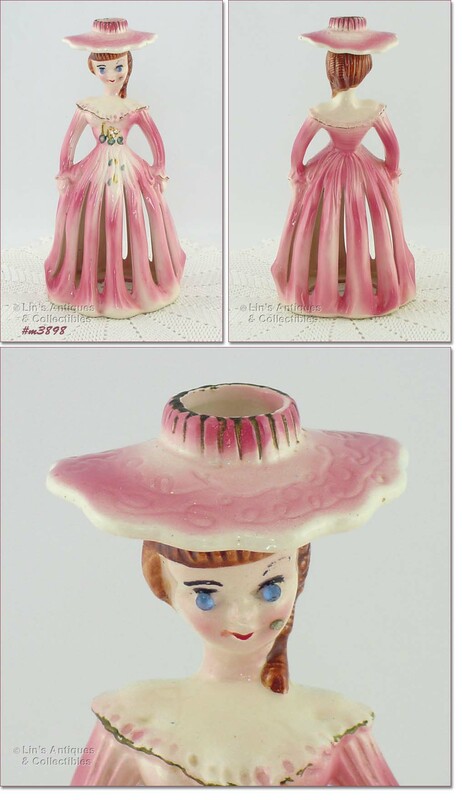 ANOTHER UNUSUAL ENESCO LISTING – A NAPKIN HOLDER AND SHAKER SET FROM THEIR COLONIAL AMERICANA LINE! THE NAPKIN HOLDER HAS A MAN STANDING BY A SCROLL WITH THE BEGINNING OF THE PREAMBLE “WE THE PEOPLE OF THE UNITED STATES”. MEASURES 5 ¾” TALL AND IS IN WONDERFUL CONDITION – HAS A TINY 1/16” DING ON HIS COAT. 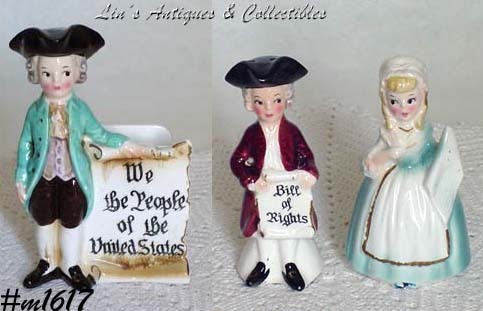 SHAKER SET IS IN WONDERFUL CONDITION -- HE HAS A TEENY ROUGH DOT ON CORNER OF HIS JACKET AND SHE HAS LOST THE COLD PAINT FROM THE FLAG SHE'S "HOLDING". THEY MEASURE 4 1/4" TALL AND HAVE THEIR STOPPERS. VERY NICE, DIFFICULT TO FIND ITEMS! 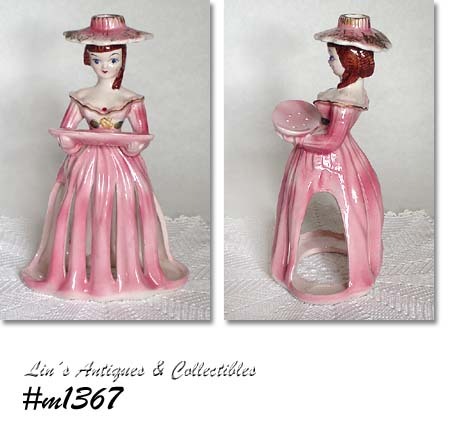 THIS IS AN UNUSUAL AND DIFFICULT TO FIND ENESCO NAPKIN HOLDER – A VARIATION OF THE MOTHER IN THE KITCHEN LINE! SHE HAS THE LACE TRIM GLUED AROUND HER APRON AND HER HAT, THE APRON HAS “IT SEEMS THE HARDER I WORK, THE LUCKIER I GET”. SHE HAS WONDERFUL COLOR AND HER FACIAL FEATURES ARE VERY PRETTY – SHE HAS LARGE, EXPRESSIVE EYES. EXCELLENT CONDITION! PRETTY NAPKIN LADY MADE BY KREISS! THIS IS "JENNIFER" IN PINK. SHE'S HOLDING A TOOTHPICK TRAY AND HAS AN OPENING IN HER HAT TO HOLD A CANDLE. THIS PARTICULAR NAPKIN LADY WAS SUPPOSED TO HAVE A MATCHING SET OF SALT AND PEPPER SHAKERS THAT SET IN HER SKIRT ON EACH SIDE -- THEY ARE MISSING. NAPKIN LADY IS IN EXCELLENT CONDITION -- SHE HAS A 1/8" DING ON THE INSIDE RIM AND A TINY 1/16" (DOT SIZE) DING ON THE RIM OF HER SKIRT (BOTH ARE WHERE A SHAKER WOULD SET). SHE'S VERY PRETTY AND THE COLORS ARE BEAUTIFUL! WOW -- SUPER NICE NAPKIN LADY! 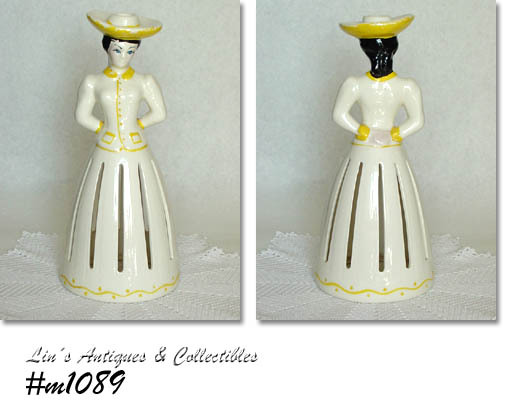 THIS ONE IS A CALIFORNIA POTTERIES PRODUCTION, SHE'S WHITE WITH YELLOW COLD PAINT ACCENTS, HAS BLUE EYES AND BLACK HAIR. SHE'S A TALL LADY AT 13"! IN WONDERFUL CONDITION -- HAS MINOR COLD PAINT LOSS (NOT UNUSUAL) AND AN ALMOST INVISIBLE 3/4" GLAZE BREAK/HAIRLINE ON SETTING RIM THAT'S IT! BOTTOM SETTING RING/RIM ALSO HAS A 1/8" PRODUCTION STRESS -- HAS GLAZE AND IS DEFINITELY PRODUCTION. BEAUTIFUL AND DIFFICULT TO FIND ITEM!